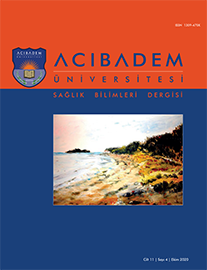 2Ankara Üniversitesi, Sağlık Bilimleri Fakültesi,Beslenme ve Diyetetik Bölümü, Ankara, Türkiye DOI : 10.31067/0.2018.59 Introduction and objective: Bodybuilding is a power sport that usually begins with the formation of body image and is carried out in the adolescent period and can be maintained long years. In this study it was aimed to determine the use of ergogenic nutritional supplements by those who participate in bodybuilding sports and to develop recommendations for nutrition. Methods: The sample of the research was composed of 111 volunteer men engaged in body building sports who registered in nine different sports centers in Ankara and were actively performing sports for a period of 4 days and at least 1-2 hours per week. Results: The data has been evaluated using appropriate statistical methods. The mean age of participants was 27.2±8.3 years. 88.3% of them stated that they were doing this sports as amateurs. It was determined that 34.2% of the individuals had been doing this sport at least 1 year, 48.6% of them had been doing 2-5 years, 13.5% of them had been doing 6-10 years and 3.6% of them had been doing for 11 years and more. On training days, the total energy intake of participants was 2982.3±1065.1 kcal / day, protein 236.8±129.7 g/day, fat 112.1±57.4 g/day, and CHO 236.6±100.8 g/day. It was determined that 81.2% of participants applied protein based diet, 6.2% applied carbohydrate based diet. As a result of the study, ergogenic nutrition supplement usage rates were 64.0%.